This ranks up there with premium comfort food. A great side for a New Year’s Day meal. OK, I confess. We even have this easy recipe as the main course on busy weeknights or for Sunday dinner. It’s a dressier version of the boxed kind. Homemade macaroni and cheese for the seven of us. A highly requested family favorite! Coat the crock pot with non-stick spray. Add all ingredients, saving 1 cup of cheese. Sprinkle remaining cup of cheese over top a few minutes before serving. Confession: It’s hard for me to remember to stop at 2 pm in the afternoon and boil macaroni noodles. I’ve found if I boil the noodles at lunch time, as I do in Make Supper at Lunch – or even the night before while making supper – it makes it so easy to toss these ingredients in the slow cooker at the right time. The point is to boil the noodles for crock pot macaroni and cheese while I am already cooking and making a mess anyway. Anyone else confess to feeding their crew mac and cheese as a main course? What’s your variation of this favorite? We ALWAYS add some crumbled up, crispy bacon to our mac and cheese. Been doing this for years. Our grandkids wouldn’t think of eating it without the bacon. Is it possible to put the size crockpot needed on each recipe? Thank you. IF THESE RECIPES ARE ALL THAT GOOD THEN WHY DON’T PEOPLE PUT A PRINT BUTTON ON THE RECIPES SO PEOPLE CAN PRINT THESE OFF FOR THEIR FAMILIES? We love my friend’s one-dish-meal version. One family size package of M&C, 1 softened 8 oz pkg of cream cheese, 1 6 oz pkg salmon, 1 16 oz pkg frozen mixed vegetables. Cook mac and veggies according to mac package directions. Drain. Melt cream cheese and butter in the milk called for on the mac package. Stir in salmon and mix well. Stir in mac, veggies and the cheese packet from the mac&cheese. Make sure it’s all mixed together well. You can either serve it from there, or put it in a casserole dish, top with chip crumbs and shredded cheese, and bake at 350 F for 30 min. You can substitute tuna, shredded (or cubed) chicken or turkey for the salmon. We do on a busy family night, I add sliced hot dogs to mine and now I will use this recipe and add the hot dogs to it! Great tips and sounds yummy! Sounds good, I add a can of tuna to my mac ‘n cheese. I think that can of chicken would be good in it. This is VERY close to the oven recipe I use and it is AWESOME!! Am thrilled to have it for the crockpot. I usually serve it without a meat as the cheese is the protein, but I also admit to liking it with hot dogs, ham and / or fish sticks. Anyone have a CP recipe for tuna noodle casserole? Anothefr fave for my family. Got to give this one a try! Sounds so simple and yummy!! To make it a well rounded meal, I add frozen mixed veggies and chopped up ham or what ever left-over meat thats in the fridge..The kiddies love it! I am a novice at using the crock-pot. 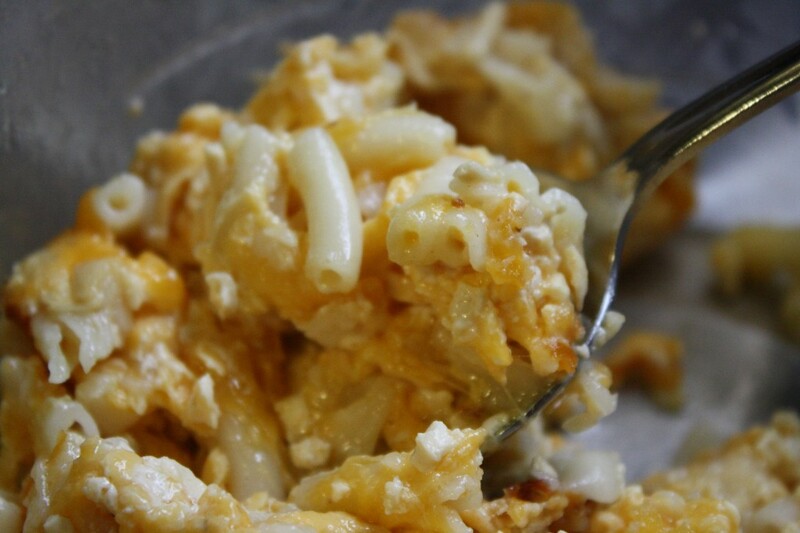 What size Crock-pot would you use to make this macaroni and cheese recipe? I look forward to making this tonight but must say there is no way you are feeding a family of seven on only half a pound of pasta. I feed 7 children and I know I need to double this to have enough. I will be adding chunks of ham to mine and serving it with green beans and fresh peaches. I cannot have milk so have been making this with a can of tomatoes with jalapeños. It works great on the stove is will try wih the crockpot. This works as a main course and a veggie, or I have been known to dice up zucchini in it and no one really notices. Great to see this recipe! I have a slow cooker cookbook from America’s Test Kitchen that I absolutely adore, but both of their mac and cheese recipes call for canned cheddar cheese soup and that is something that I refuse to buy. Eww. We’ve had “pizza” mac ‘n’ cheese…add diced tomatoes, pepperoni, a tiny bit of pizza sauce (just for flavor) and anything else you’d like on a pizza. The kiddos LOVED it. The kids would eat mac & cheese everyday if I let them, so it is nice to find different flavorings, varieties, or add-ins to switch it up. Our quickest way to make it a meal, & a little healthier, is to cook up a bag of frozen peas & carrots & toss them in. The kids also like hotdogs mixed in, so gotta have those veggies in there to take away some of the mom-guilt.